Most everyone thinks their dog is the sweetest and most well-behaved dog in the world, so I will probably ruffle some feathers when I say that our dog is the sweetest and most well-behaved dog in the world. Kayla is a chocolate lab we rescued a little more than two years ago. She’s about six years old and hates to be left alone. We live on the San Francisco Peninsula and wanted to take a road trip up the coast. Since Kayla is all the things I mentioned above, we decided to take her with us. We drove down Highway 101 to Cambria, which is about a 3-hour drive, and then we spent three days on Highway 1 driving home. Here are all the places we ate, played, and stayed at. Cambria Pines Lodge: The biggest challenge when traveling with a dog is finding pet-friendly accommodations. Our first stop was the Cambria Pines Lodge, which has a dog park on their 25-acre grounds. Our cabin was spacious and had a deck overlooking the forest. Riverside Campground & Cabins: You might think that Big Sur would be a very dog-friendly place, but it isn’t. There’s only one place to stay in all of Big Sur that allows dogs. It’s the Riverside Campground & Cabins, which has campsites right on the Big Sur River, as well as RV sites and cabins. Very friendly staff. Dogs aren’t allowed on State Park beaches so there are limited beach and hiking opportunities in Big Sur. 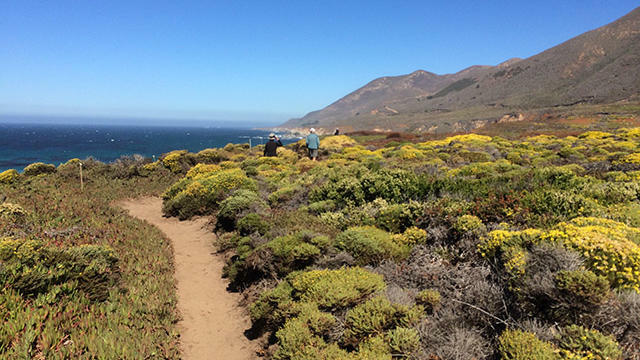 Costanoa: This place has two two dog-friendly cabins. The dog-friendly cabins are out in the campground/RV area of Costanoa and our cabin was very comfortable. Kayla made friends with a black lab named Moe and chased sticks with him in the dog area Costanoa provides. Dogs aren’t allowed on the adjacent beach but are allowed at nearby Bean Hollow State Beach. Moonstone Beach: Moonstone Beach in Cambria has a one-mile boardwalk along the coast. Dogs aren’t allowed down on the beach, but the boardwalk is a fantastic walk and dogs are welcome there. Kayla was particularly interested in all the ground squirrels that live in and around the boardwalk. Garrapata Beach: Driving north from Big Sur, we stopped at Garrapata Beach, which is dog-friendly. It’s a beautiful walk from Highway 1 to the beach and Kayla enjoyed both the walk and the beach. Redwood Café: In Cambria, there’s a restaurant with a pet-friendly outside area for lunch. The kind folks there even offered to bring a bowl of water for Kayla. Sam’s Chowder House: After we checked out of Costanoa, we headed up the coast to Half Moon Bay for lunch. A highlight of the trip was our lunch at Sam’s Chowder House, with a dog-friendly deck overlooking the ocean. The food is wonderful and the view is spectacular. Highly recommended. Our road trip adventure included spectacular scenery, and Kayla enjoyed being with us and exploring the coast. I have to admit, I was a bit apprehensive when we started the trip. But Kayla proved herself to be the sweetest and most well-behaved dog in the world, and we would definitely do it again.